After climbing up many, many steps to the top of Monkey Temple, right at the very top when you can see the end, there is a small ticket window where visitors pay a small fee. ($2-3 USD) I knew there was a fee, but on a hot sunny day and seeing the end so close I didn’t notice the office window off to the left and an officer flagged me down to directed me over to pay the fee. 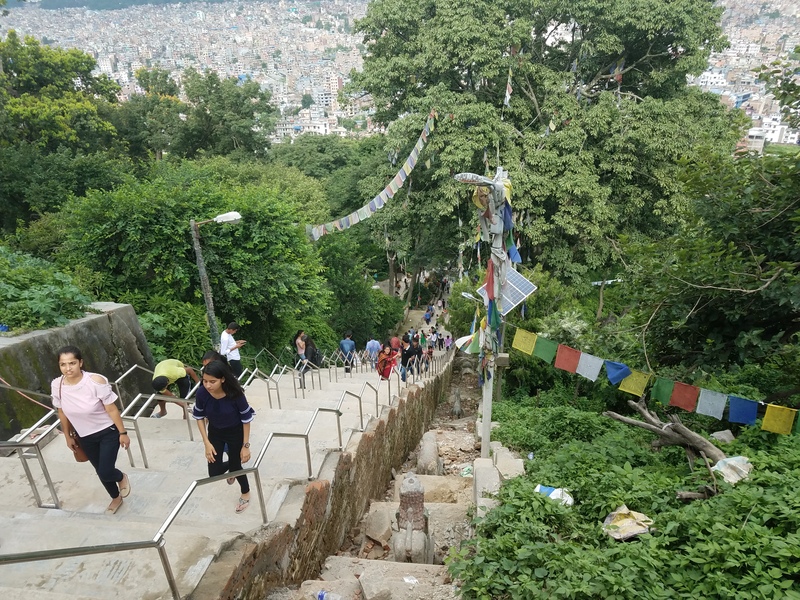 After the ticket window, there are still a few more flights of stairs of the 365 step to make it to the temple at the top. When you do get to the to, buy a bottle of water to catch your breath. From the top of Swaymbhunath or monkey Temple, you can see most of Kathmandu valley and all the beautiful colors making up this vibrate city. As the name implies, there were hundreds of monkeys running and climbing around. 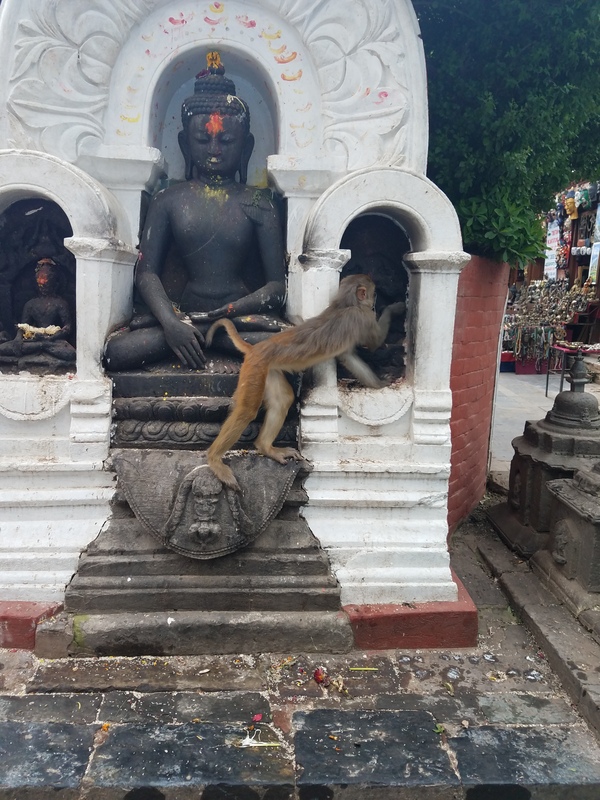 Tibetan Buddhists and Hindus consider monkeys holy and offerings are left for them. I didn’t have any trouble getting here. I could see the temple peeking up above the city and simply walked from my Zostel. It was a 30-minute walk from the city and just to make sure I asked a few locals along the way and followed the pointing fingers onward. Getting taxis are very easy is Kathmandu, usually getting ripped off a bit every time. The roads are narrow and wild in Nepal, especially after the recent earthquake. Piles of rubble still laying of street corners a year or so later. Riding in a taxi is a very exciting process but I generally walked because I felt safer and I saw more. 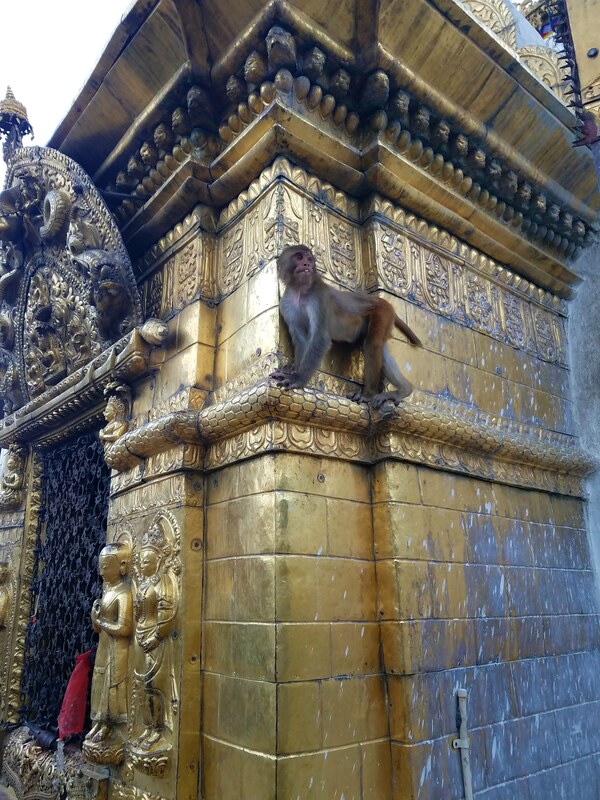 There is another way up to the top of Monkey Temple. When you walk up to the front of the temple there will be three statues and the start of the stairs leading up. If you walk all the way around to the other side, the back there is another shorter and much easier way to reach the top. 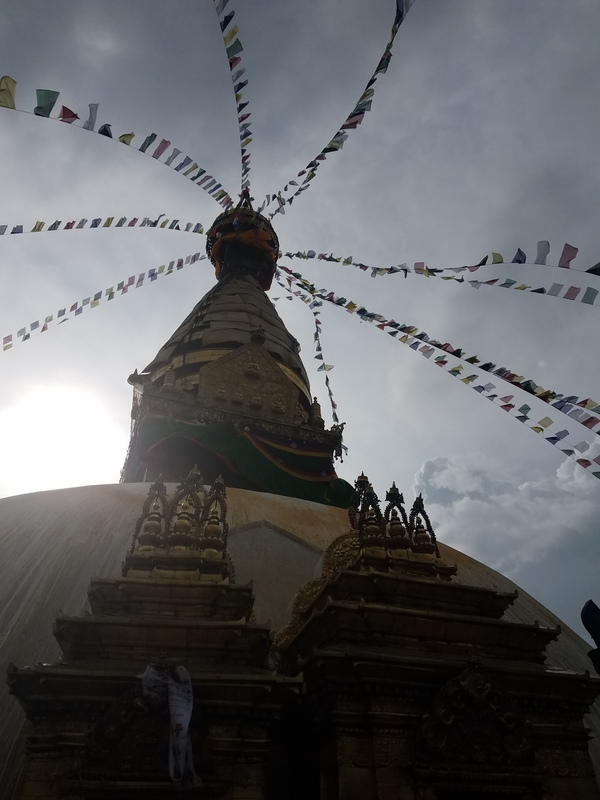 There is so much to take in around Kathmandu, Nepal.